I was lucky enough a couple of weeks ago to have a quick visit from a lovely friend from Ottawa. 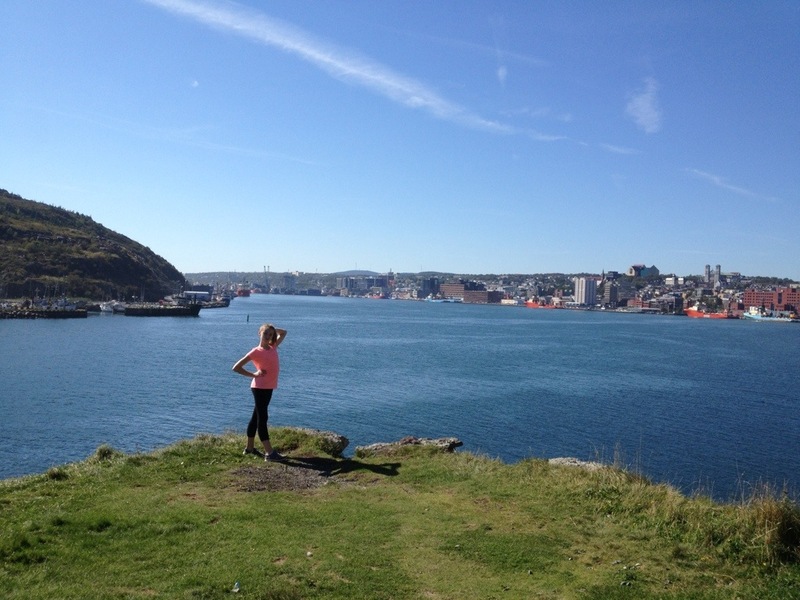 She had never been to St John’s before, so I needed to figure out where to take her to give her a good tour so she could she what St. John’s is all about. She was working during the day, so we only had two evenings to fit everything in. When I heard she was coming for a visit, there was one activity I KNEW for sure I wanted to do with her. 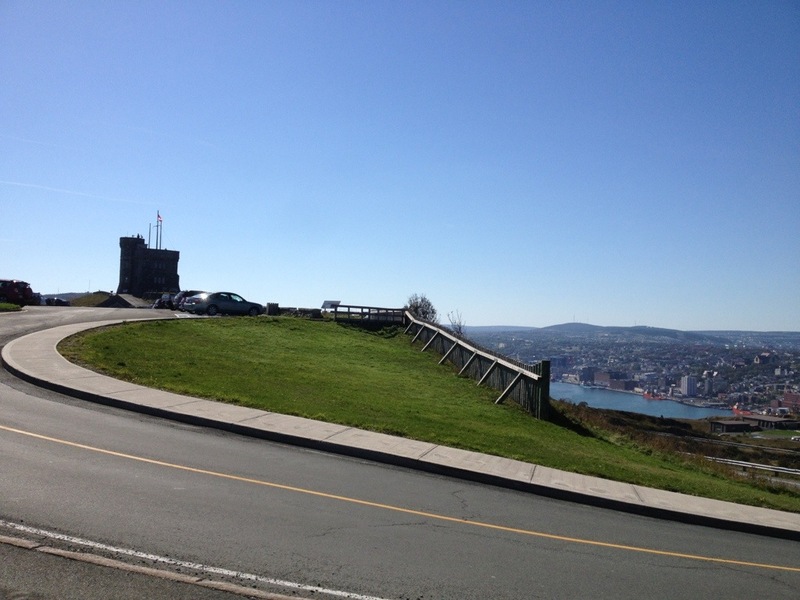 I picked her up at the airport and we made a bee-line to Signal Hill to do the North Head Trail. Amazingly enough, it was 19 degrees and completely sunny!! GLORIOUS! 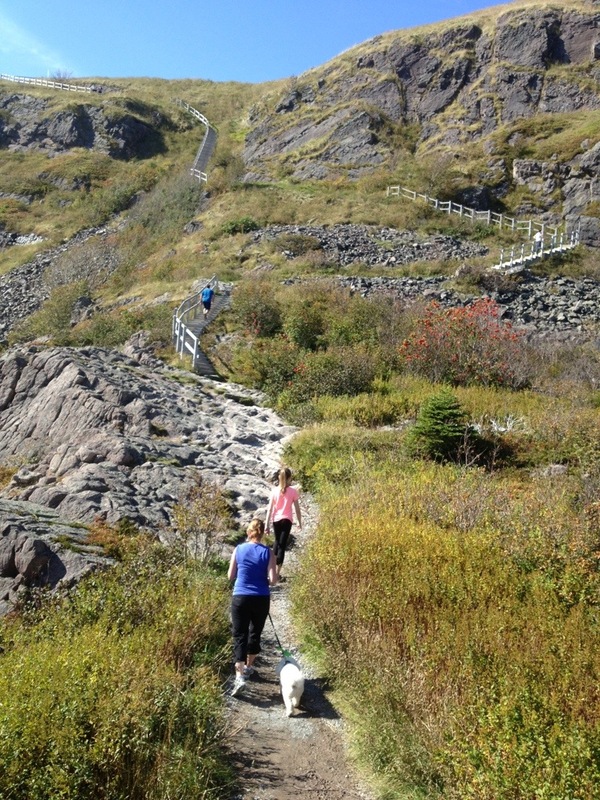 There were lots of people out enjoying the fabulous weather on the trail. I was so happy to get to show off this wonderful place! Truly it is my happy place! 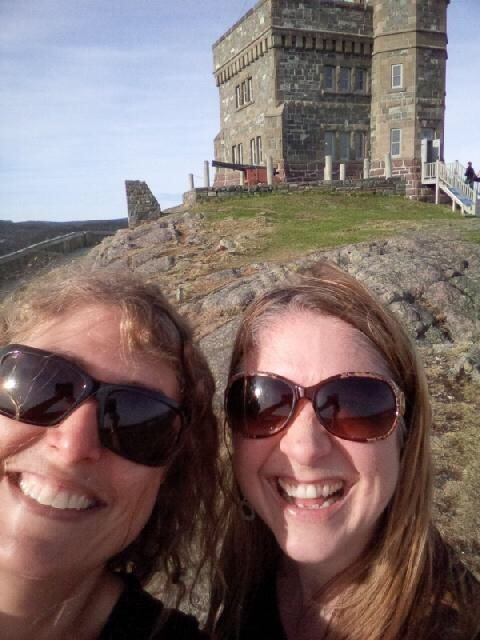 We were cracking up laughing trying to take a selfie near Cabot Tower! We went for supper at Portobellos on Duckworth Street. 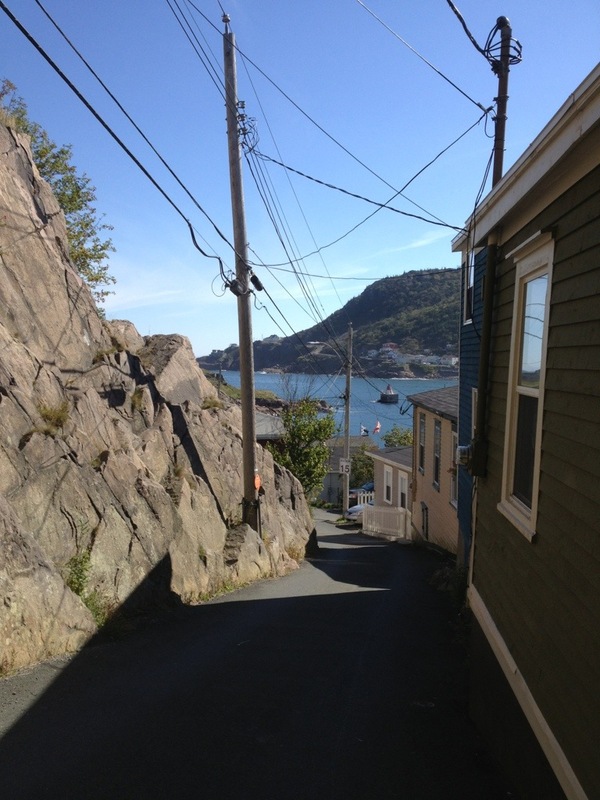 I had never been there before but I had heard the view of the Harbour and the Narrows was beautiful. The food was good but the view really was incredible! I was especially glad we had such amazing weather for the first evening, because when I woke up the next morning and looked out my window – I could hardly see across the street for the fog. 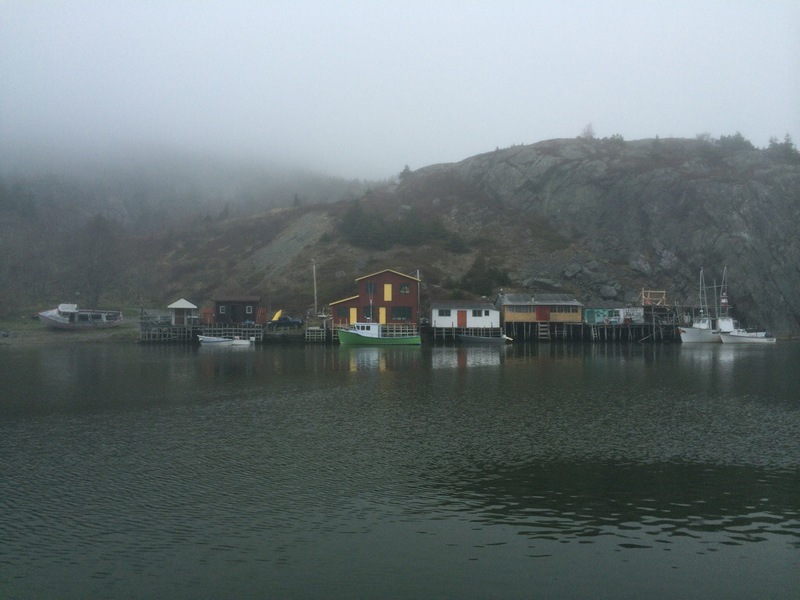 I mean it was true pea soup fog – so thick that visibility was really diminished. My girlfriend was working out at the airport on the tarmac that day and she said they could hear the airplanes close by, but still couldn’t see them in the fog. HA! The weather is only one of the reasons this is definitely a unique place. For our second evening together I really wanted to go see an iceberg with her. It was an opportunity not to be missed – seeing an Iceberg is not something you do in Ottawa regularly. So I checked out the Iceberg Finder website (LOVE THIS!) 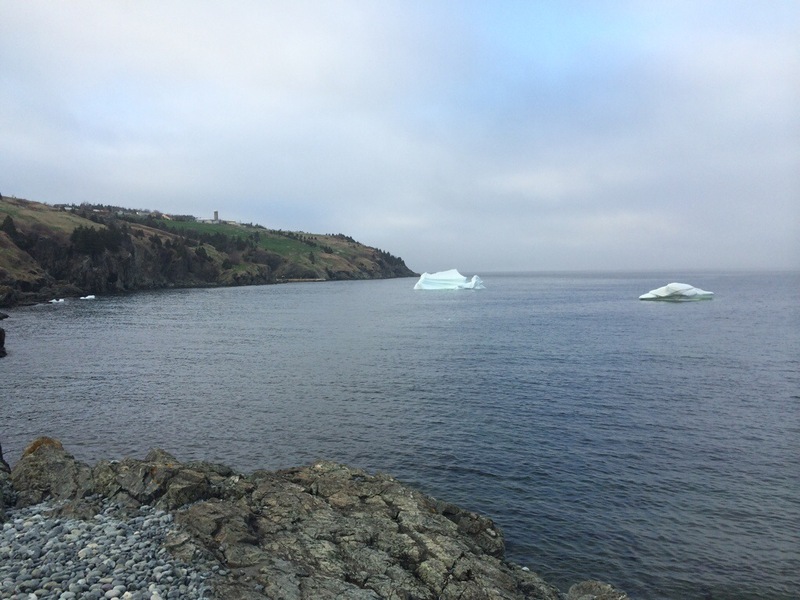 and realized there was an iceberg in Torbay. We took a quick drive (15 – 20 mins from my house) and were able to see one! I’m sorry my iPhone camera just does not do this justice – It really was beautiful! 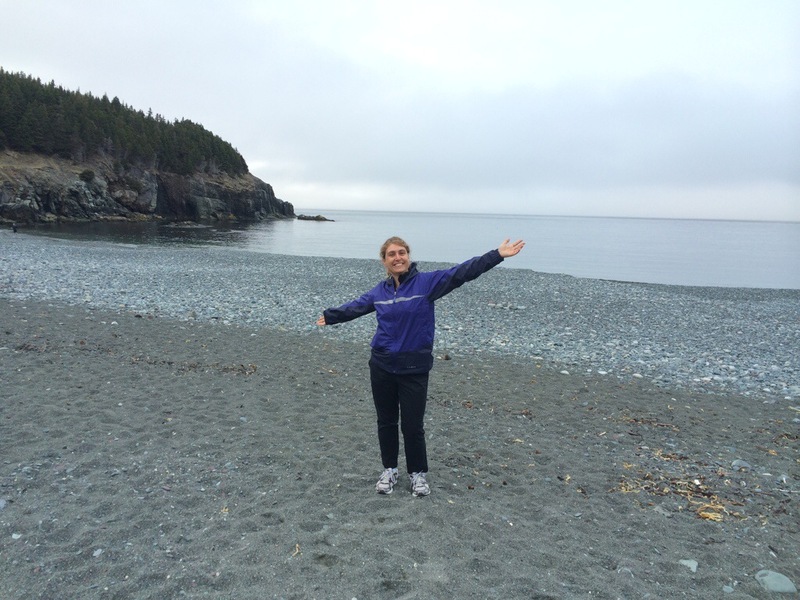 We swung by middle cove beach on the way back . 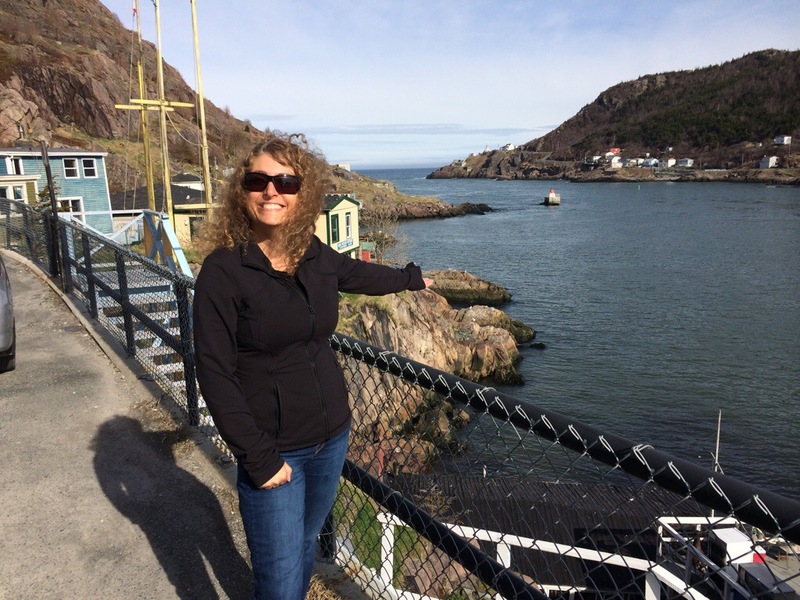 Quidi Vidi Village is very picturesque and worth a quick photo op. I think the fog made it look even more charming. We did a little shopping downtown to find some little treats for her to take home to her family. She was so excited to see all the chocolate at Coffee & Company on Water Street! 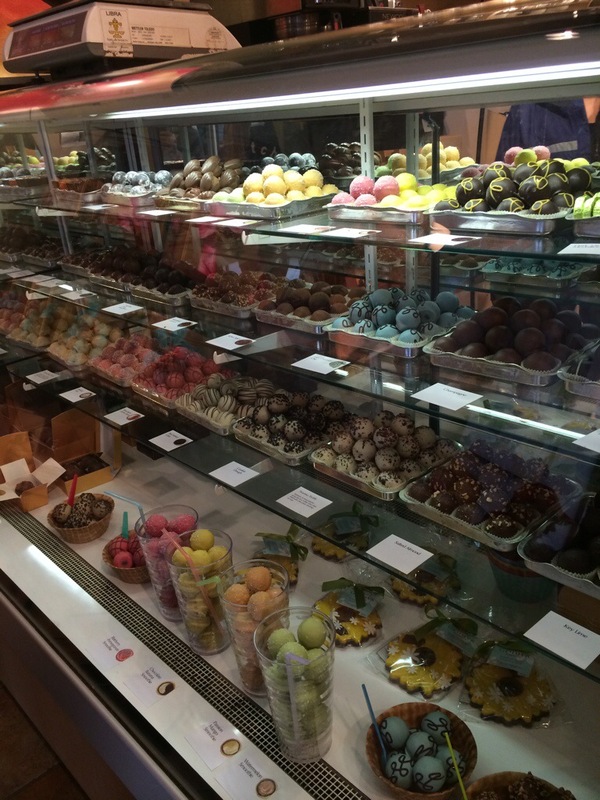 She bought some Godiva chocolate to take home and treated K and I to a yummy truffle from the cabinet. This is a wonderful locally owned and operated cafe – I knew that the coffee was delicious at Coffee & Company, but now I can attest that the chocolate is also FAB! If you haven’t been before, you need to go there! Honestly, I wasn’t sure about going for Fee & Chee (how do you spell that?) 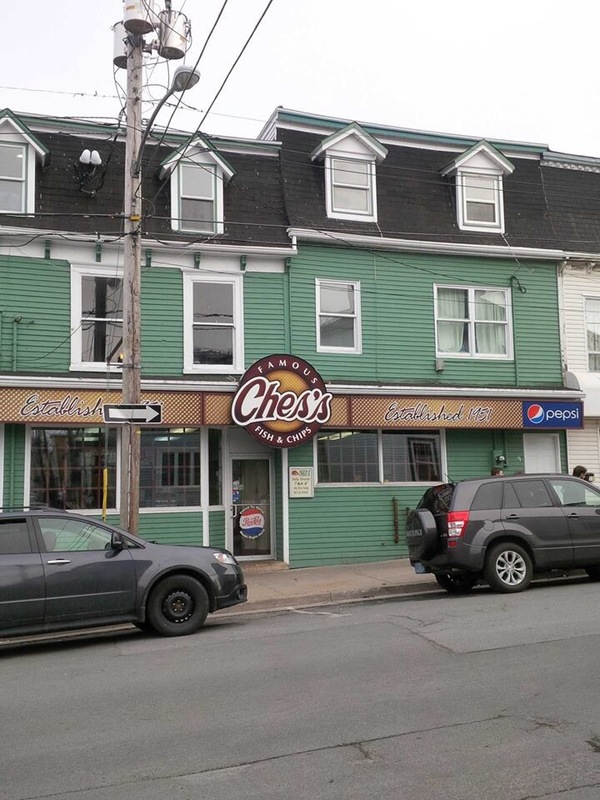 for supper but it seemed like the thing to do in St. John’s. We headed over to the landmark that is Ches’s and I ordered Fish with Chips, Dressing and Gravy (like you would) but my friend was not convinced about adding dressing to a meal. So she ordered it on the side just to see. I don’t think she would order it again but at least she can say she did once! 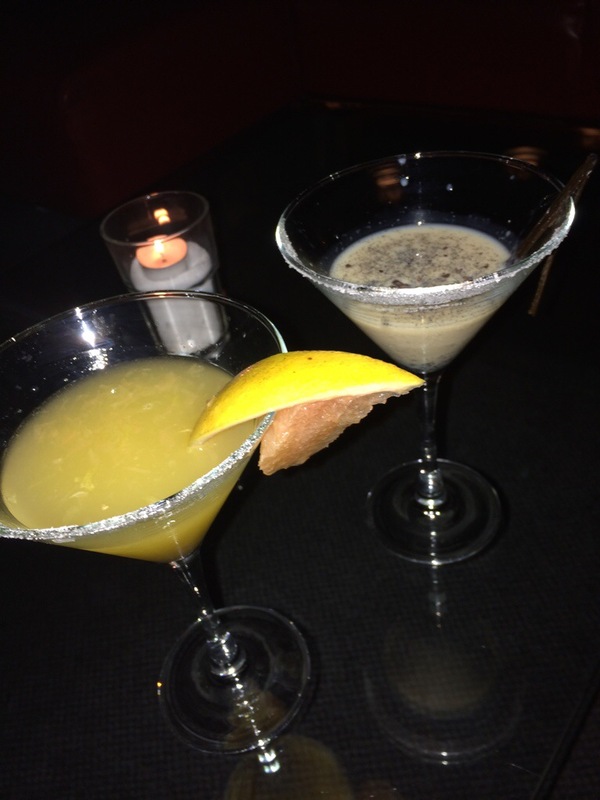 After doing a carpool run to bring K to dance we decided to end the evening with martinis at Basho. For the record, the fancy drinks at Basho are the absolute BEST! I would not recommend you go and just order a rum and coke or a rye and ginger, or any run-of-the-mill drink. You can get those anywhere….. Pick one of the specialty drinks! They make your entire evening feel special just sipping on one of them! There are lots of places we didn’t get to visit and things we didn’t do, but considering we only had two evenings, I think we did well. I LOVED having her visit!! 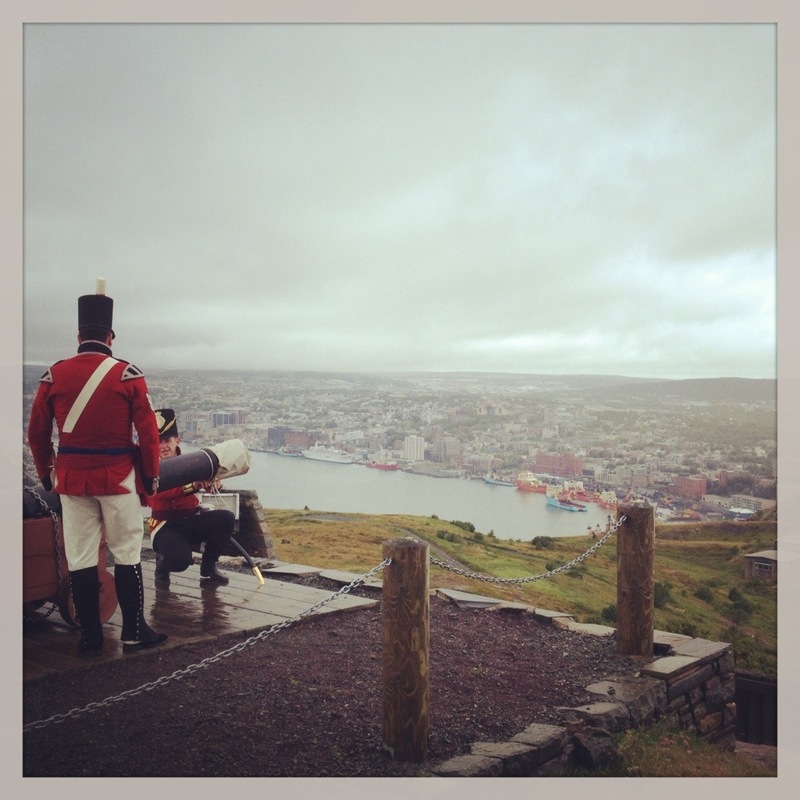 Next time she comes, we will hit Cape Spear and maybe Fort Amherst….. Oh and there’s lots more I can think of! 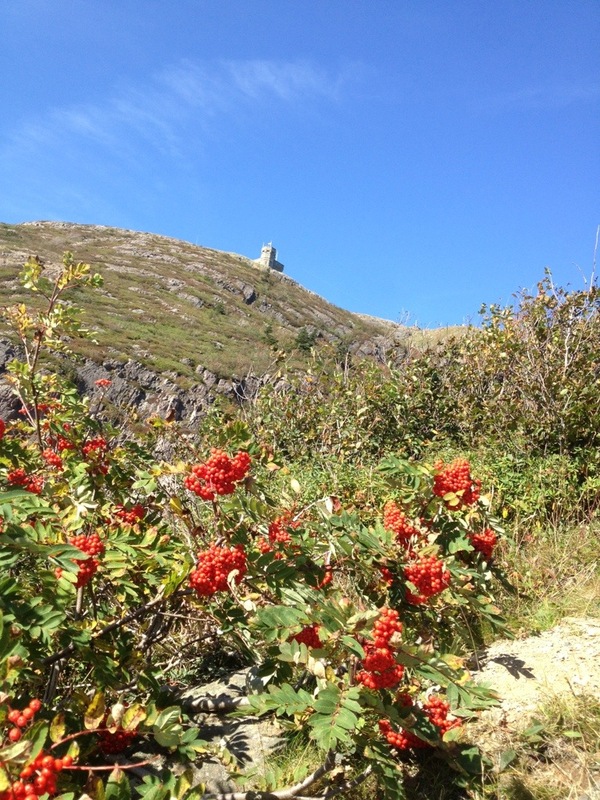 September 30th was a record breaking day for weather in St. John’s. 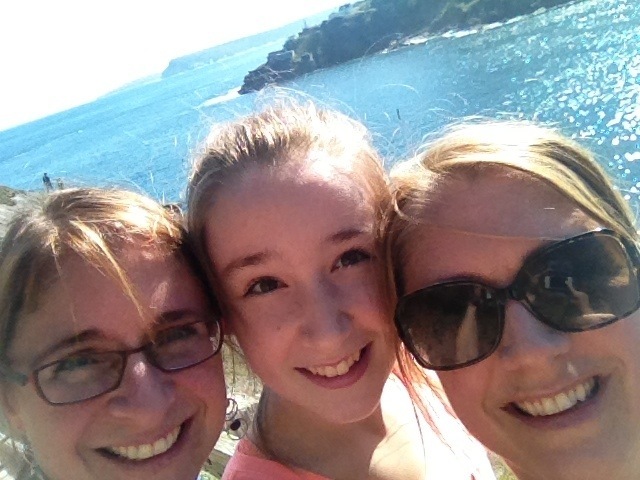 It was also a PD day for my daughter so I convinced her to join sister #2 and I for a hike on the North Head Trail at Signal Hill. 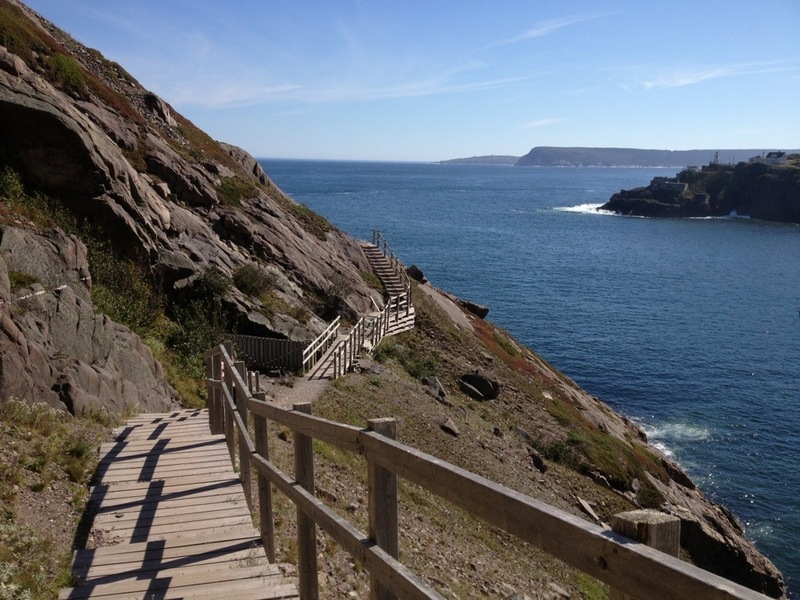 The last time I did this trail, I started at the top of Signal Hill, walked down the trail and then retraced my steps again back up the trail. This time Sister #2 parked halfway up the hill and we walked down the road through the Battery and onto the trail to do a full loop back to the car. I’m not sure I would have found the beginning of the trail on my own. 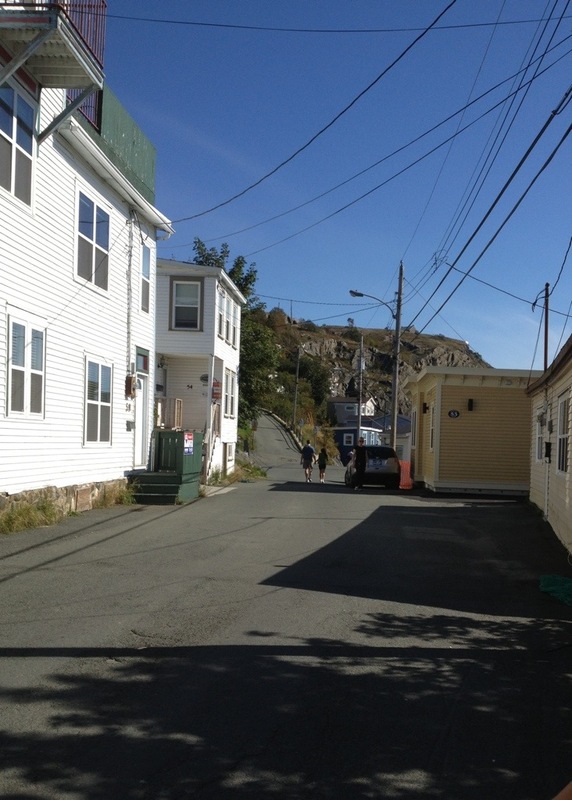 You have to walk through the houses in the Battery and then walk over someone’s deck to get to the beginning. 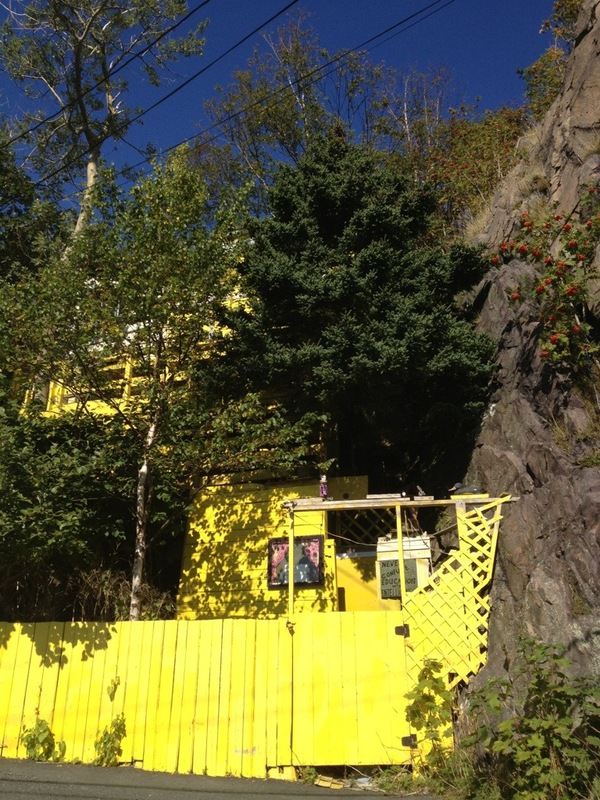 The houses are all built very close together and in many cases, built right into the rock and very close to the road. While it is quaint and interesting this time of year, I can’t help but imagine what it is like in the winter time. I’m guessing just a bit harsh! It feels like you are in a totally different country. So interesting. There is definitely a view like none other. My ballerina striking a pose. 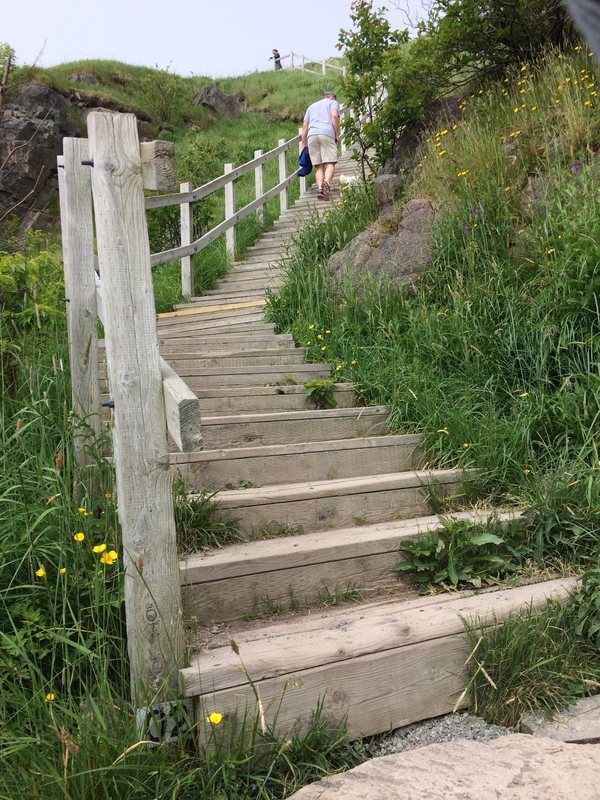 When I did this trail in July, you could smell the wild roses everywhere. This time of year, the trail was littered with dogberries and you know I love them! I don’t think it matters how often you do this trail, it is always breathtaking. 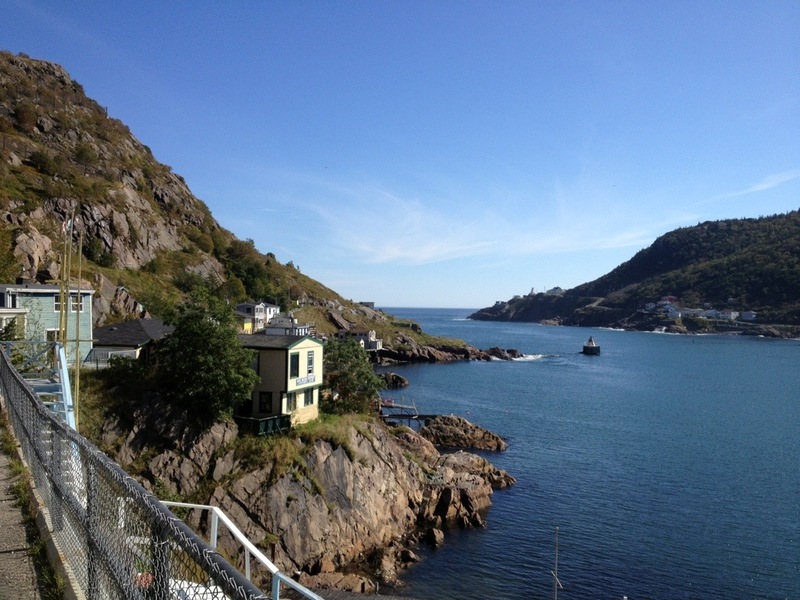 You can see Fort Amherst in this photo below. One of my favourite things in the world is to see the sun sparkling on the water. 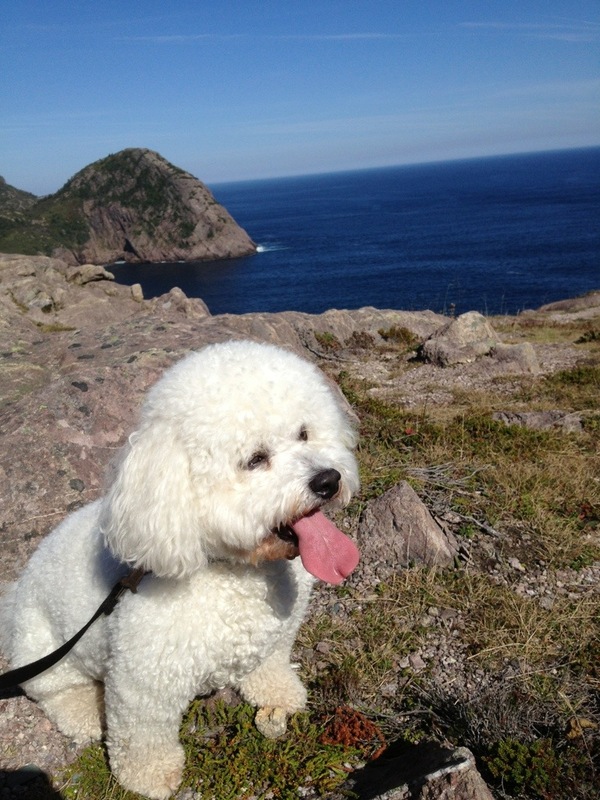 Rocky came with us – He was pretty pooped by the end of the walk but he’s always happier to come with us. 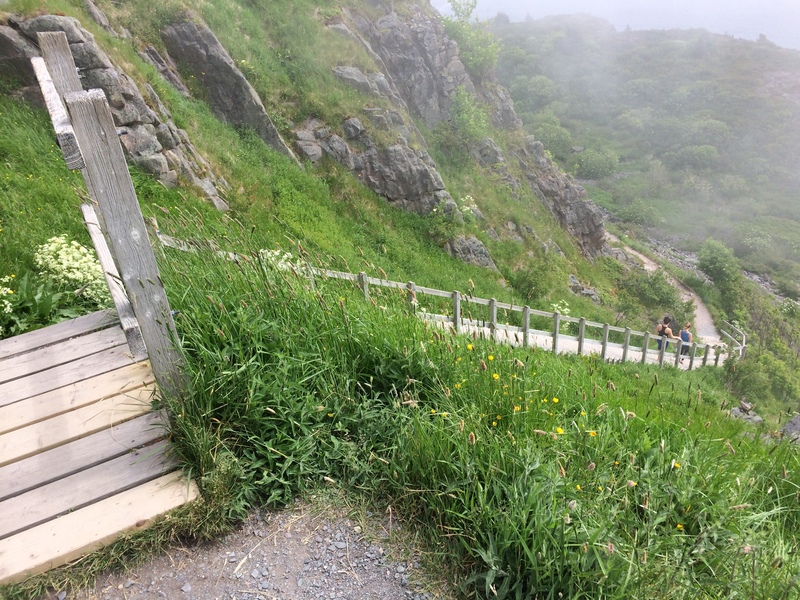 The hike up to the top got my heart pumping. 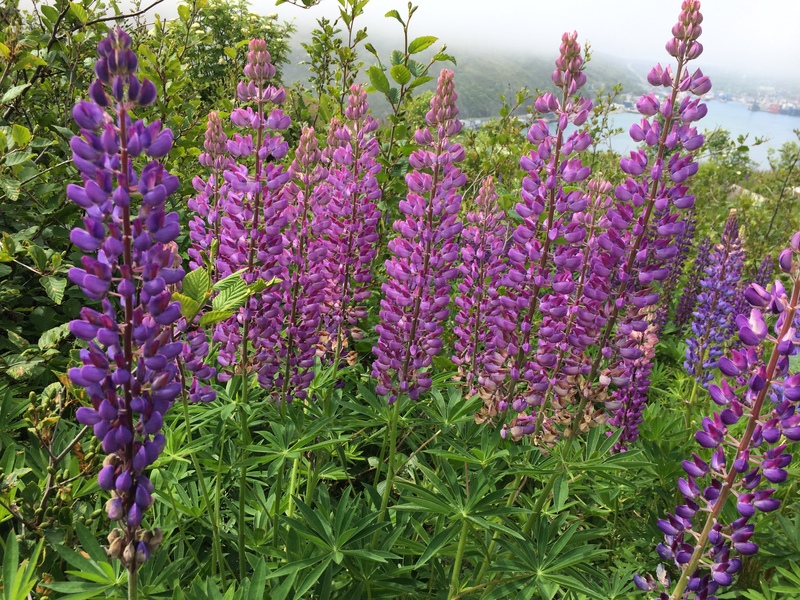 It is such an invigorating hike – you feel like a million bucks when you are done. SO much better than heading to a gym. 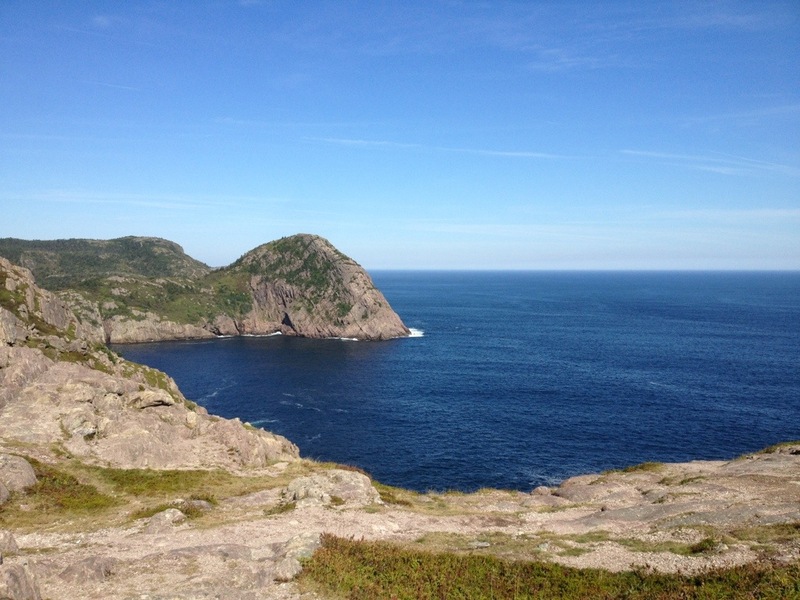 St. John’s is so fortunate to have this (and many other) wonderful hikes. LOVE. 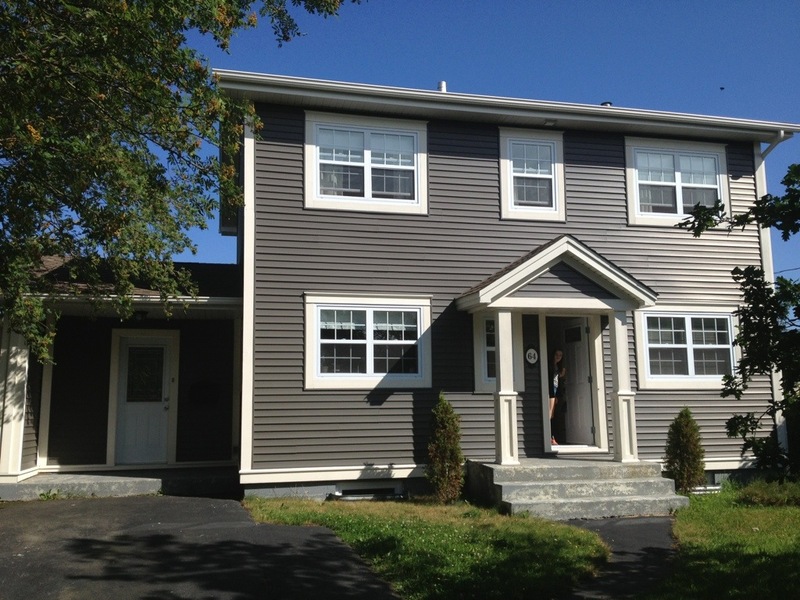 We have officially been in St. John’s for one month. We’ve done a lot in that month. – DD has found her dance studio and made some friends. – Both kids have done a musical theatre camp and DS was asked to join in the Wizard of Oz musical cast for performances in October. He has started rehearsals, is loving it and making friends. 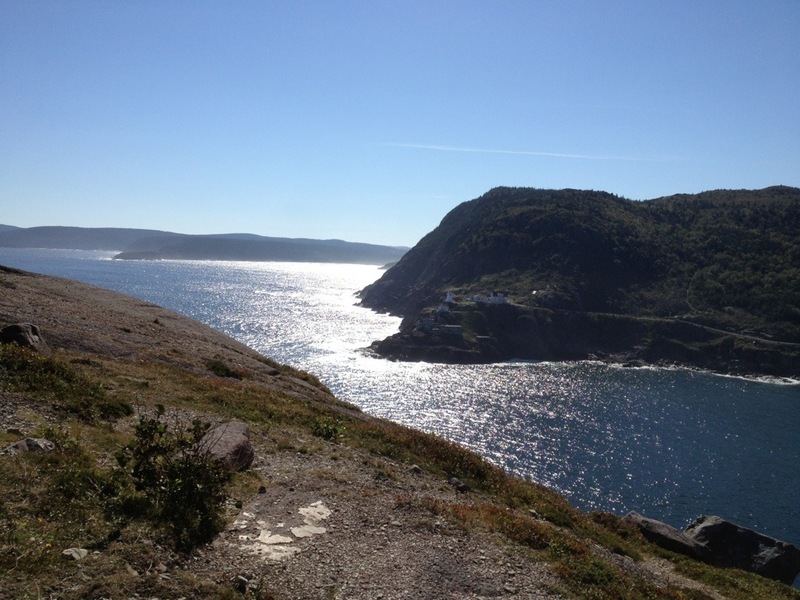 – Went hiking, hiking again, sea kayaking, to Hant’s Harbour, Daniel’s Cove, Spreadeagle, the Regatta, Signal Hill and more! Whew! We’ve packed a lot into one month! 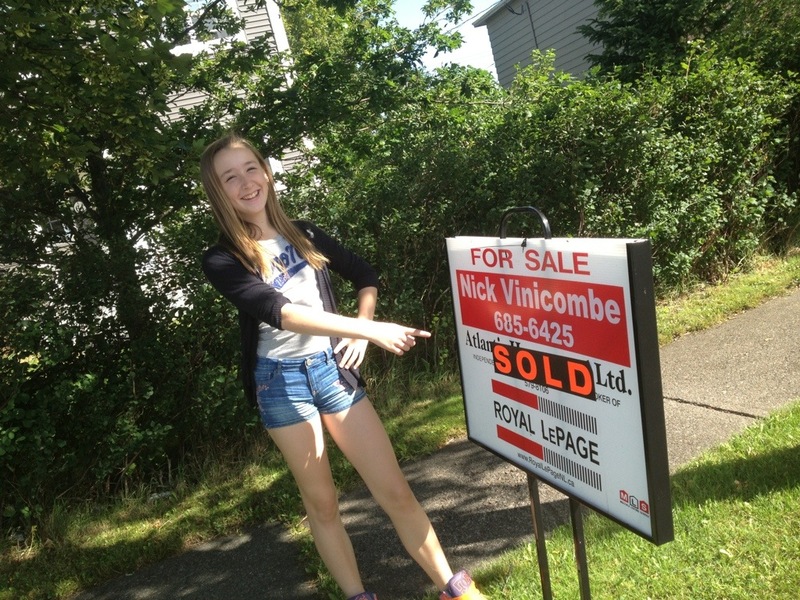 – We bought a house! We are in the process of arranging renovations, but at least we know where we are going to live. And the best part is that it is exactly in between sister #2 and sister #3. Yeah! – We have seen lots of family and feel so lucky to be so close to everyone! – DH is settling into working at home. It will be better once we have our house. The sun room will be his office and is bright and happy. Since he will be working out of the house, having a positive place to work each day is key! – I have lots of house and life details still to arrange, but I will need to start job hunting soon. Wish me luck with that! So all in all, a productive month. Every now and again someone will comment to me that this was “quite a big move for us all“, or that it is “a big deal to move your entire family at this point in our lives (especially the kids)“. Sometimes I get that look of “Are you crazy?“. Well, I guess it is a big deal. And maybe we are a bit crazy. It doesn’t feel crazy. I still have this gut feeling that everything is right in my world, even when I’m feeling a bit overwhelmed. And honestly I do have those moments. But we are where we need to be. That much is still crystal clear. Can’t wait for month two. 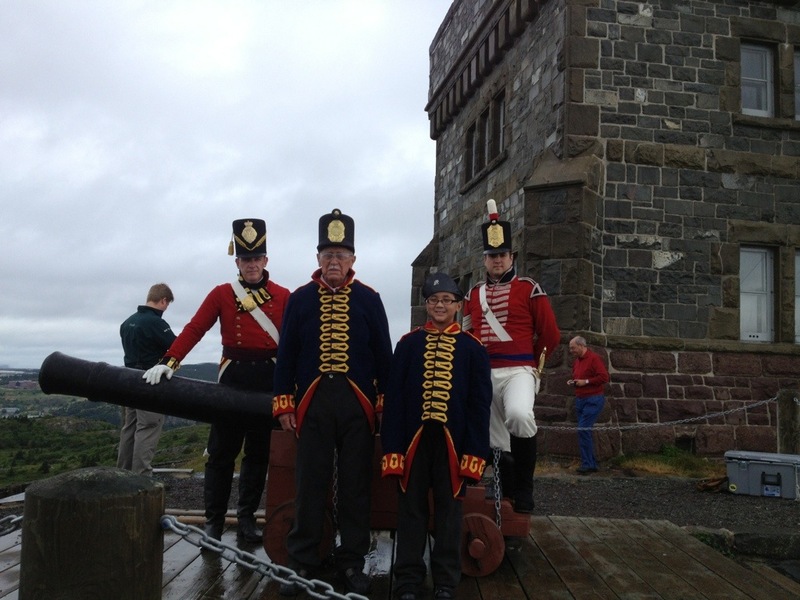 Last week was my nephew’s birthday and my S-I-L had the great idea to book my nephew and F-I-L on Signal Hill to help fire the noon day gun. My nephew seemed pretty excited about doing this on his big day and they both were given special uniforms to wear while they were involved in the canon process. I initially thought the uniforms were just a fun touch, but apparently they are a safety precaution as well, in case there are any sparks from the canon. Either way, it was fun to see them dressed up and looking official. 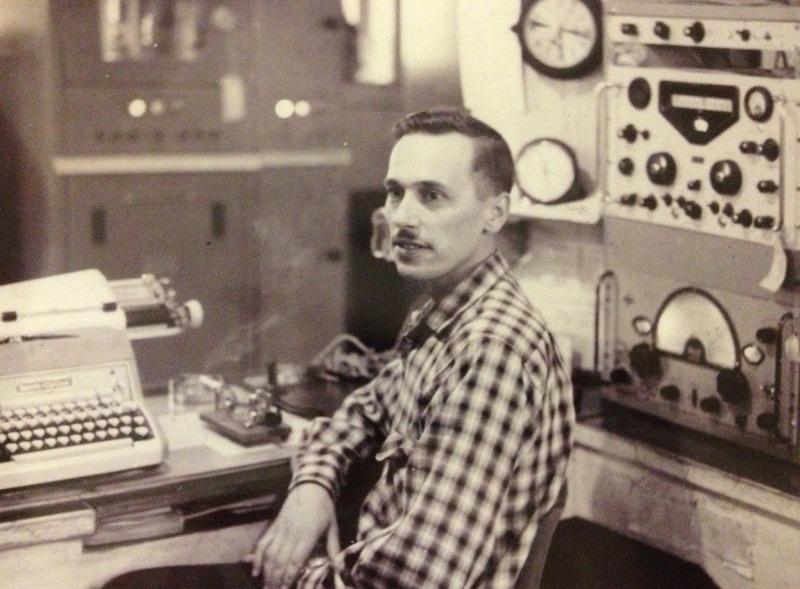 What made this extra special was that my F-I-L used to work in Cabot Tower on Signal Hill back in the day as a Wireless Radio Operator for the Canadian Marconi Corporation. And although firing the noon day canon wasn’t part of his duties, occasionally he was called to help out in this regard if the regular guy was indisposed (aka had a few too many lol). 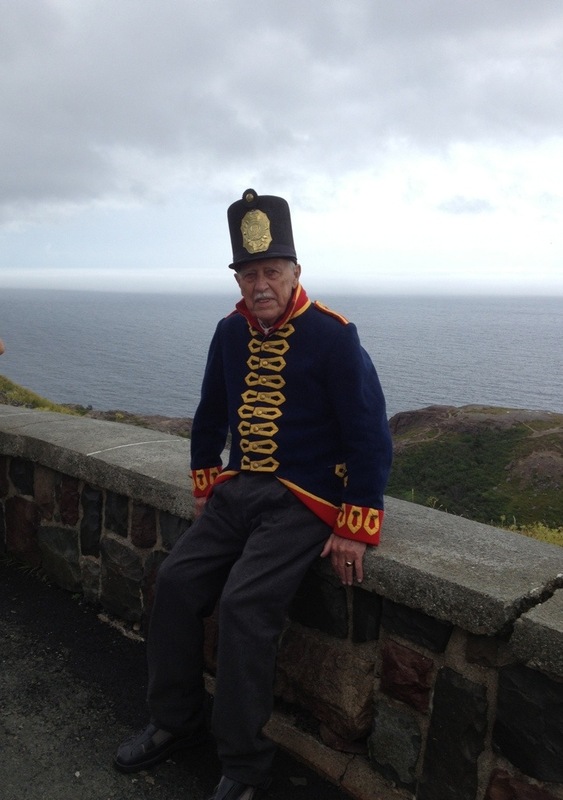 When he went to change out of his uniform, the current Signal Hill guys made a big deal about him, since he was the first person to help them out, who actually had fired the noon day gun officially. Below is a photo of my F-I-L working in Cabot Tower. It wasn’t yesterday! A sweet experience for my nephew and his grandfather. I found this article which talks a little bit about the Noon Day Gun. Check it out if you would like a bit more information. You can see the video below of the actual canon firing.